" Some men just want to watch the world burn. " Emilie is an extremely tall, willowy woman who looks as though she’s entirely made out of arms and legs. She has very little in the way of curves; she claims that she forgot to grow in any direction but up. She has fine, straight black hair that she keeps cut to just above her shoulders, with blunt bangs that she keeps meticulously trimmed. Her skin isn’t especially tan, but neither is she especially pale, and she doesn’t seem to sunburn easily. The first thing one is likely to notice when looking at her face is that Emilie has a number of obvious scars: one running in a half-circle across her right cheek, another just above the left side of her lip, and one that’s slightly more difficult to spot just barely in front of her left ear, running back into her hairline. A fainter one marks her chin. However, most obvious of all is the heavy scarring above her nose and across her forehead where her eyes should be, running from her left temple to where most of her right ear is missing. Even without the scars she wouldn’t have been especially pretty, but with them she takes on a fearsome appearance. The palms of her hands and forearms are just as scarred, though those are rather more difficult to notice. Emilie is practically chaos incarnate. She lives for trouble, and doesn’t particularly care who she causes it for. She loves to see how people react when she does things, especially if those things make their lives more difficult. She lies at the drop of a hat, and makes up stories about everything if she thinks that the truth is too boring. She especially lies about her scars: the story changes almost every time she’s asked about them, and ranges from a wher attack to a fire lizard attack, a fight with a wild feline, Thread, Fort riders, or even a mythical giant tunnelbeast that lived in the tunnels of her cothold. She’s insecure and uncertain of herself, and covers it up with an incredible amount of acting. She can pretend to be anything she wants to be, whether or not she believes it herself. Outwardly she is cocky, arrogant, insensitive, and an expert on anything and everything. There is little she holds sacred, and nothing is too sensitive a topic for her to make fun of. She’ll spread rumors about anything and everything, including even herself if she thinks it will be interesting to watch. Emilie was the sixth of seven children born to a pair of farmers, and basically destined to be nothing but a farmer. Few people ever left to do anything else, and that was certainly true of her siblings, all of whom would go on to become farmers themselves. She grew up with far more siblings than she would have cared for, and all of the younger children were afraid of one of them: Email. To them, it seemed that he lived to torment them, and the older two and their parents brushed it off as a bit of youthful trouble. “Some people are like that, but most grow out of it,” they said. Email never grew out of it. When nobody else was looking, he often made his younger siblings do his chores, threatening to hit them if they didn’t comply. So they complied, until eventually a teenaged Emilie and her brother Remi decided they’d had enough of doing his work. It ended rather poorly for them, as Email pulled out his belt knife and attacked them with no further provocation, intending to wound rather than kill, and only stopping when Laimar and their father saw what was happening and pulled him away. Email was sent away that evening, branded Holdless and told that he would never be welcome home, and likely not welcome anywhere at all. Emilie and Remi were left with scars that they’d bear for the rest of their lives, Emilie on her face and arms where she’d tried to defend herself, and Remi on his back because he’d tried to run. But, scars aside, the wounds would heal in time, and life continued as it always had. They tithed to the Weyr, occasionally lost much of their remaining crop to raids, but somehow survived the winter in spite of it. In time the war ended and the raids stopped, and life grew a little bit easier for Emilie’s family, but still nobody ever really thought of leaving. It wasn’t an exciting life, but it was enough of one. Emilie made trouble and was quickly called out, and though she may have wished she could get away with more, she never really thought she’d go anywhere else until one of Golre’s riders came on search. She didn’t go willingly, but the High Reaches riders didn’t care. They needed people to stand, and if some of them were really only worthy of being greenriders, well, someone had to impress to those dragons. And if they proved to be loyal greenriders, well, all the better. However, after a short time at the Weyr, Emilie realized how much easier it was to rile up people there. All she had to do was spread rumors about Golre, or an attack by Fort, or that there was a woman who planned to make a bronze choose her. It was so easy, and the people were just as easy targets as the events happening around her. Eventually Golre died and the Weyr fell, but still she stayed. She had no loyalty to the place, and wouldn’t have felt any remorse if the place burned to the ground, but it was a place to be. Besides, things were being rebuilt, and that meant there would eventually be more outsiders around. Outsiders that she could find ways to mock and rile up and so she stayed as a Candidate despite everything. Besides, if she Impressed, imagine how much trouble she could cause with a dragon around to help her. Has continued to fail repeatedly as a Candidate, not even attracting the notice of any dragons, let alone actually Impressing. Was mauled by a hatchling, who didn't even realize she was there. Quit Candidacy, is now just a farmcrafter. Transferred to Fort, ostensibly to learn farming techniques. Attempted to force-Impress Nornth; was instead blinded and badly mauled by the gold. She lost most of her right ear, and her face was badly scarred. Stumbled upon—quite literally—a hatching wher egg. Ended up with Esk, and the two share a mutual disdain for each other. Esk is... Very clearly not your average wher. She's even stubbier than most whers, with short legs and more than a little propensity towards pudge. And her hide is bright. Very bright. She has a base of vibrant fuchsia, splashed in places with darker magenta and red. This would all be well and good if it weren't for the green leaves that seem to be scattered across her, especially on her wings, sides, and forelegs. 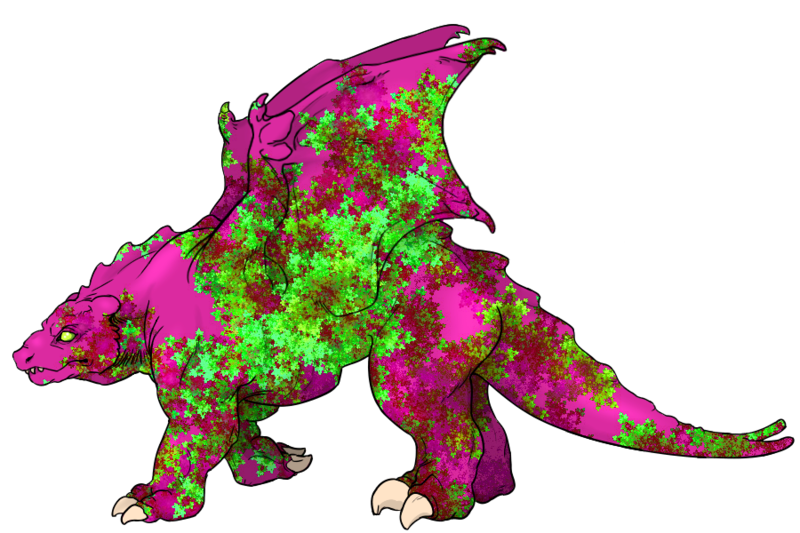 They range in hue from bright lime to spring grass, and make it very clear that she isn't just garnet. There is no subtlety about her, though she is a garnet, thank you very much, and she'll bite anyone who wants to claim otherwise. Her voice is a bit deeper than one might expect from such a colored wher, with a bit of raspiness to it. She sounds surprisingly masculine. Anyone who thinks whers are all big, strong, and dedicated needs look no farther than Esk to find the lie. She’s immensely lazy, selfish, and demanding. She cares only about herself, and attaches herself to her handler solely because she considers her a source of food; loyalty is an unfamiliar concept to her. Any way she protects her is solely to protect her food and oiling supply. She’s more than a little pudgy, being prone to overindulgence and not especially fond of exercise. She’s more than happy to lie around all day, only stirring herself for meals, and it takes a lot of prodding to get her to do anything. She’s grumpy and often crass. Toward other people, Esk is ambivalent. As long as they don’t threaten her or her food supply, she couldn’t care less about their existence. She’ll talk to them if they talk to her, but mostly she doesn’t care either way. However, anyone who insults or irritates her and is within range of her teeth (because she’s not about to go through the effort of getting up to start a fight) is likely to be bitten.